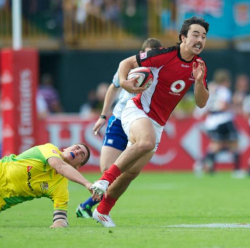 Canada started the 2018-2019 HSBC Sevens season against last year’s 5th ranked team England – this fixture and in fact this tournament was always going to challenge the Canada men after a disruptive summer and fall which once again saw more turmoil surrounding the union and its Neanderthal approach towards our players. Hence preparation for the coach with his squad has been brief despite the commitment of the players to keep fit while they stayed away from the COE during another unpleasant strike. On appearance the coach seemed no less frustrated by yet another preparation disruption but it did not prevent him from getting out to local games and watching the talent on the field – something the other COE staff should emulate. If you got up early to watch the first tournament of the season it seemed clear that for Canada Day 1 could be summarized as a day where opportunities were lost and not converted. The good news is that we were scoring points against our pool opponents – particularly England and Australia who are ranked higher. But as many points as we end up scoring it’s a certainty that we leave far too many points out on the field and not converted. In fairness several teams on display today looked like they needed to shake off the off-season cobwebs and Canada was no exception. Day 2 will open against a dangerous Zimbabwe challenge and Canada will need to be alert and ready as we move into the Challenge Rounds. Congratulations must go to our women’s Sevens Team for their second place finish in Dubai – the team is full of energy and potential and clearly deserved their place in the Dubai Final – well done to our Ladies! Canada started Day 2 with a win over Zimbabwe who had shown glimpses of form on Day 1 especially against Samoa who they should have beaten. That said Canada put together probably their best performance of the tournament and the score really did reflect the effort on the field. On reflection it seems clear that this team has a way to go before they find their game form – the margins are thin in order for this team to be successful. As an example - any well written paragraph must have good grammar, exact spelling and specific punctuation in order present a proper document and this team with this particular personnel must play to that theme. The game plan and the execution of that plan must be precise otherwise we are exposed and errors are punished with catastrophic results. It seems clear that the coach knows how to get the best out his squad with the talent available to him presently and until that changes with an influx of fresh talent Canada must stick to the specific script in order to win games. Will a new group of youngsters come along before our mighty veterans grow gray beards – questionable… but if a guess was required – probably not. Sustaining the ‘circuit -life’ in Canada for our men and our women takes enormous fortitude and a resilient character – something our sevens players past and present have always had. And something the national union has never completely understood. This present team is not a ‘run-n-gun’ outfit we suggest and to be accomplished and post up wins they must stick to the script which requires enormous dedication, concentration and immense and fortitude. Any deviation from that will see us chasing games on the modern day circuit. Clearly this will be an interesting year for our Sevens Program and there will be lots of distractions particularly away from the field – obviously the team has set some team goals of their own which include qualifying for the Olympic Games and how this plays out with the muddled decision makers at the COE remains a confusing picture. Reporting structures are in a chaotic shambles of disarray in Langford and the loss of Director Meaghan Howat is more than significant and will do nothing to resolve the ‘real work’ that is required on a day to day basis. She leaves a massive gap at the COE and a workload that would cause the rest of the staff several back-to-back Myocardial infarctions – she will be sorely missed particularly by the players under her care. South Africa is a long flight away for our boys this morning as they cross the Equator and head into southern Africa – but at least Emirates Airlines knows how to make their passengers comfortable! Cape Town is next – stay tuned and good luck to our Sevens men!